A look back at pro wrestling history. They interview Rokambole and then Mocho Cota. Mocho Cota said he trained the same strategy that he did from their previous match for this rematch with Americo Rocca. La Fiera is Mocho Cota’s second and Rokambole is Americo Rocca’s second. The “Queen of Lucha Libre” shows up to take photos with the luchadores. Another woman shows up to take photos with the tecnicos. Mocho Cota looks extremely happy prior to the match. The referee is Rafael “Guero” Rangel. FIRST FALL: Mocho Cota tells the referee to check Rocca’s shoes properly. Both are trash-talking each other before the bell starts. Cota gets Rocca in a hold early on but Rocca breaks out and gets him in an armbar submssion. Quick pin attempt by Cota while reversing the hold. A couple of near falls while both mat wrestle. Mocho Cota yells out to the fans. Cota takes Rocca down with an ankle-lock hold. Rocca hiptosses Cota and takes him back down with a side headlock. Cota tries to get out of the hold but just circles right back into it. Rocca armdrags Cota. Cota gets back up and gets Rocca in a submission hold working on Rocca’s shoulders. They continue to exchange holds on the mat. Cota gets Rocca in an armbar submission. They get too close to the ropes and have to break. They continue to wrestle more on the mat with Cota grabbing Rocca’s hand and bending it. Rocca reaches the ropes but Cota doesn’t really break the hold. Rocca gets up and bounces Cota’s head on the mat a few times while Cota has him in a deathlock. Rocca bulldogs Cota a couple of times working on his head. Rocca backdrops Cota and hits a dropkick. Rocca goes for a pin after a belly-to-belly suplex. Rocca goes for reverse rana on Cota and gets the pin. La Fiera pretends to be a bullfighter as he’s waving a towel to give more air for Mocho Cota during the break in between falls. SECOND FALL: Rocca starts the fall by slamming down Cota to the mat. Cota grabs at his head still selling the late first fall offensive assault he encountered. Cota and Rocca get tangled up near the ropes and have to break again. Rokambole tells Fiera to back away from the ring. More matwork as Cota works on Rocca’s left leg again. Rocca escapes and gets Cota in a side headlock. Referee warns Rocca about choking. Cota tosses Rocca around. Rocca writhes in pain grabbing his back. Cota continues his attack with a neckbreaker. Cota gets Rocca in the camel clutch. He breaks as Rocca doesn’t submit. Cota sends Rocca back first to the corner turnbuckles. Cota gets Rocca with a dropkick. He slams him down on the mat and jumps off the middle rope with a senton. He only gets a 2-count. Cota goes back to slamming Rocca to the mat. He finally gets Rocca to submit to La Reinera (called La Mochina) for the 2nd fall win. Rocca is shown in pain but he gets fired up right as the next fall starts. THIRD FALL: Mocho Cota charges at Rocca but he moves and Cota hits the ringpost. Rocca hits a couple of topes at Cota in the ring and then gets a 2-count after a plancha. They exchange nearfalls with ranas. Cota gets a 2-count after a plancha. Rocca gets in another rana on Cota and then bridges over him. Cota grabs Rocca’s arms and they are both in a pinning position. Referee counts three. Rocca’s confused. Referee said both’s shoulders were pinned so it ends up being a draw. Good match. Mocho Cota celebrates the draw like he won because he did get to keep his title. Mocho Cota’s laughing and points in delight at Americo Rocca. Rocca is upset and argues with the referee. Cota and La Fiera continue to celebrate. Mocho Cota points at his head letting everyone know he’s smarter than Rocca. Referee Rafael Rangel said both men’s shoulders were pinned. Americo Rocca tells the referee that it shouldn’t have ended that way and said he was robbed. WINNER: Mocho Cota retained title on a draw. 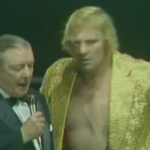 The 2/10/1984 show opens with wrestlers and other EMLL officials in the ring having a moment of silence for El Santo who passed away on February 5, 1984. The crowd starts chanting, “Santo! Santo!! Santo!! 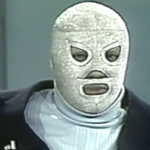 !” Dr. Alfonso Morales gives some history on El Santo including how he got his name and mentions that El Santo’s mother didn’t want him to wrestle. 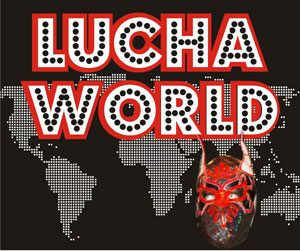 Mentions all the places that El Santo wrestled and his legendary tag team with Gori Guerrero. Cien Caras and MS-1 exchange a few moves. Herodes and Tony Salazar get in. Herodes gets in a couple of cool spots early on and then bumps like crazy for Salazar. Salazar punches Herodes in the face. Referees warn Salazar. Guerrero Azteca gets Espectro Jr. in a quebradora. MS-1 comes into the match and Guerrero Azteca uses his quickness and rope work to keep MS-1 confused. Guerrero Azteca dropkicks MS-1 out of the ring. Espectro Jr. bumps Salazar down. Salazar gets Espectro jr. in a pair of headscissors. Salazar sends Espectro Jr. to the outside. Cien Caras hits a running tope at Herodes . Herodes sends Cien Caras to the outside but he lands on his feet. He gets back in the ring and he armdrags Herodes, sending him to the outside. Salazar uses the ropes to take advantage of MS-1. He hits a reverse tope off the ropes at MS-1. Salazar tosses MS-1 over the top rope. Cien Caras monkey-flips Espectro Jr. and then armdrags him. Espectro Jr. rolls to the outside. Herodes and Guerrero Azteca have a brief posedown. Herodes bumps like crazy for Guerrero Azteca. He gets sent to the outside near Doña Vicky who is said to be very sad due to the news of El Santo’s passing. Espectro Jr. and MS-1 double-team Salazar. Referees try to break it up while also keeping the tecnicos out of the ring. Herodes sends Salazar to the outside. Referees keep Herodes from attacking Salazar. MS-1 and Espectro Jr. double-team Guerrero Azteca. Cien Caras tries to make the save. Rudos hit Guerrero Azteca with a couple of knees and it appears he’s given up. They do the same to Cien Caras and he gives up as well. Rudos win the 1st fall. Herodes continues to attack Tony Salazar and lands a senton on him. Referee Gran Davis counts Herodes pin on Salazar despite the other two tecnicos having given up earlier. SECOND FALL: Dr. Alfonso Morales takes over on commentary. More double-teaming from the rudos as MS-1 and Espectro Jr. beat on Cien Caras. MS-1 knocks Cien Caras out of the ring. The rudos beat on Guerrero Azteca in their corner. Salazar and Herodes start brawling outside. Cien Caras gets back in the ring and starts working on Espectro Jr’s leg. He jumps out of the ring. Tony Salazar gets back in the ring and hits Herodes in the midsection and Herodes claims that he was fouled. Refs don’t believe him. Salazar takes down Herodes with a fist. Cien Caras and Guerrero Azteca send Espectro Jr. and MS-1 crashing into each other. Cien Caras hits a plancha on MS-1 on the outside. Guerrero Azteca uses an inverted bear hug to submit Espectro Jr. Herodes fouls Salazar. Tecnicos win the 2nd fall. Everyone goes to the outside of the ring and continue to argue. THIRD FALL: MS-1 and Espectro Jr. continue their attack on Guerrero Azteca until Cien Caras makes the save. Guerrero Azteca and Cien Caras then double-team Espectro Jr. While the other four are in the ring in action, Herodes continues to attack Salazar outside the ring. Cien Caras chases Herodes away. All three rudos beat on Cien Caras. Espectro Jr. charges out to kick away Guerrero Azteca. The rudos start ripping apart Cien Caras mask. Cien gets Espectro Jr. in a bear hug but the rudos attack him. Guerrero Azteca runs in to help, but the rudos toss him at Cien Caras, who’s mask is turned to where he can’t see anything, so he bear hugs Guerrero Azteca. Salazar finally gets back in the ring and makes a comeback for the tecnicos. Salazar knocks down Herodes a few times. Herodes tries to foul Salazar, but he blocks it and Salazar instead fouls Herodes to get his team disqualified. OK match. Dr. Morales interviews Herodes who’s laying on the floor and Herodes is upset that Salazar fouled him and that’s not what a real man does. Salazar heads over to Herodes and beats on him a little more. Espectro Jr. challenges Guerrero Azteca to a mask match. They all continue to brawl after the match. Tecnicos argue with the referees about getting DQed. WINNERS: Espectro Jr., Herodes & MS-1 via DQ. Colosetti gets interviewed by Dr. Alfonso Morales and said he was going to wipe the floor with Halcon Ortiz and Ringo Mendoza. Mocho Cota brought along a small snake. Dr. Morales asks him what kind of snake it is. FIRST FALL: Mocho Cota gets Ortiz in the rudo corner and they triple-team him. Colosetti and Supremo work on Mascara Año 2000 while Ringo Mendoza tries to get in the ring. Ringo’s able to attack Supremo. Mocho Cota gets in the ring and stops Ringo. Supremo knees Ringo and then Colosetti kicks him. Mocho Cota with a knee drop off the top rope on Ringo Mendoza. Ortiz gets in the ring and Cota gets knocked down by him. Cota is able to back drop Halcon Ortiz. Ortiz slams Cota to the mat and Cota crawls out of the ring. Colosetti tries to drag Ortiz to his corner but Ringo gets in the ring. Ringo with a nice scissors spot to take down Colosetti. Colosetti does this great comedy spot where he runs in place before charging at Mendoza and gets sent to the outside. Mascara Año 2000 uses a pair of headscissors on Supremo and then monkey flips him. Mascara Año 2000 armdrags El Supremo to the outside. Ortiz slams Cota to the mat again and tries to get him in a tirabuzon but the other rudos make the save. Mascara Año 2000 and Ringo Mendoza get Colosetti and Supremo in the star (estrella) and Ortiz gets Cota in la tapatia for the win. Tecnicos take 1st fall. SECOND FALL: Colosetti knocks down Mascara Año 2000 with a forearm. He stomps on him near the ropes. Ringo gets in the ring and attacks Colosetti but Supremo makes the save. Mocho Cota gets in and is joined by the other two rudos in attacking Ringo Mendoza. Halcon Ortiz isn’t allowed in the ring by the referees. Cota slams Ortiz after he finally got thru the referees. More double-teaming from the rudos on Ortiz. El Supremo lands a senton on Halcon Ortiz and the rudos pin him. Colosetti gets the pin on Ringo Mendoza after a side slam. Rudos win 2nd fall. THIRD FALL: Starts off with the rudos still beating on Halcon Ortiz. Mascara Año 2000 gets back in the ring and the rudos continue their attack on him. Mocho Cota drops a forearm off the top rope onto Mascara Año 2000. He does it a second time. El Supremo starts trying to take off Mascara Año 2000’s mask. Ringo comes in and starts unmasking El Supremo. Mocho Cota stops Ringo. Mascara Año 2000 starts to remove El Supremo’s mask. Ortiz knocks down Mocho Cota. Ringo gets Colosetti with a cool move landing on his neck. He tries for a half crab but Mocho Cota makes the save. Mascara Año 2000 tosses Colosetti into the ropes. El Supremo and Mascara Año 2000 exchange forearms until Mascara Año 2000 dropkicks him out of the ring. Mascara Año 2000 then hits a plancha onto El Supremo. Colosetti slams Halcon Ortiz. He goes for a second slam, but Ortiz small packages Colosetti for the pin. Ringo Mendoza gets Mocho Cota in some quebradoras and gets the win. Tecnicos win the match. Good. Halcon Ortiz does an interview. He remembers El Santo and said he was a wonderful person. As he’s talking a fan warns him that Colosetti’s coming at him. LOL! Halcon Ortiz wants a hair match with Colosetti. Colosetti calls himself a superior race to Halcon Ortiz. Everyone continues to brawl after the match. Unfortunately this match wasn’t complete as the vhs tape recording ran out after the end of the second fall, but what made video was pretty great. Dr. Alfonso Morales asks Faraon why he has grown to dislike Lizmark and he also gives a similar response to what Coloso Colosetti gave early about them being a superior race. EMLL has for a long time had a history of doing weird race or nationalist related rivalries. It’s almost an extreme to what wrestling promoters would do in the U.S. with the “pro-U.S.A. vs. foreigner” feuds. Faraon attacks Lizmark right as the bell rings. This feud kicked off after they both returned from a Japan tour. Faraon sends Lizmark to the outside. He brings Lizmark back to the ring and beats on him before kicking him back out of the ring. Fan throws trash at Faraon as he chokes on Lizmark back in the ring. High knee-lift by Faraon takes down Lizmark. Lizmark’s athleticism is on display as he lands feet first a few times when thrown by Faraon. He dropkicks Faraon. Lizmark bounces off the ropes and armdrags Faraon to the outside. Lizmark follows with a tope suicida!!! Lizmark returns to the ring looking totally worn out and wins the first fall via countout as Faraon can’t get back in the ring. Referee El Gran Davis tries to keep Lizmark from going after Faraon outside the ring. Faraon slowly returns to the ring at the start of the second fall. Lizmark hits him with a couple of topes and lands a plancha on him. He follows it up with a pair of dropkicks at Faraon. Lizmark gets a 2-count after a double underhook suplex. Faraon gets back into the match with a backdrop and a pair of sentons. He gets a near fall. Faraon gets Lizmark with a suplex and wins the second fall. Faraon kicks at Lizmark as he rolls out of the ring. No finish shown due to tape running out. 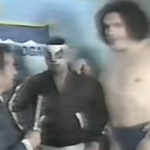 SHOW THOUGHTS: The series of matches between Mocho Cota and Americo Rocca for the NWA World Welterweight Title were fun. Here we had the 2nd match and it was good. It’s fun seeing Mocho Cota play up being a rudo and in the first match the two had he did whatever necessary to win the match and this time around he retained the title by having the match end in a draw. That didn’t stop Mocho Cota from celebrating like he’d won the match cleanly. I really wished the 2/10 show was complete since it would have been fun to have had that Lizmark vs. Faraon match complete. The first fall was pretty great and the second fall was more about Faraon getting back into the match and beating up Lizmark. 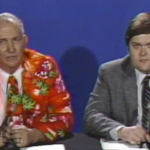 Both those guys were phenomenal luchadores and if there was more footage of them, we’d be talking more about them. Lizmark was around more as there were more ways to record shows in the mid/late 80s and forward, but Faraon was from a different era. I uploaded that partial match to youtube because I felt some would at least enjoy watching what was available of that match. The two trios matches from the 2/10 show were in the ok/good range. Second one I enjoyed more. Probably because it had a better finish. Both matches had a ton of heat and had guys trying to keep rivalries going. Have questions, comments or show review suggestions?